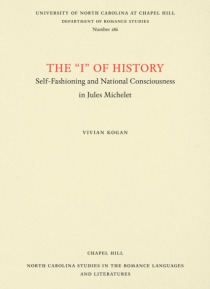 The "e;I"e; of History: Self-Fashioning and National Consciousness in Jules Michelet examines the poetics of the historian's self-portraiture as it intersects with the nation and history. History exists because someone tells the story. In Michelet's unique staging and performance of the past, the way the story is told is the story. Long before Charles de Gaulle, Michelet asserted that he &… quote;was"e; France. His self-representation as the "e;I"e; of the nation and the embodiment of history ("e;moi-histoire"e;) takes form as a rhetorical personification that shapes the historian's writing as it informs his project to use history to construct the nation. Offering a new multidisciplinary perspective, The "e;I"e; of History both exposes Michelet's vision of France, his grand narrative, and it demystifies that narrative in the analysis of Michelet's final text, History of the Nineteenth Century.